JOAN CHITTISTER loves stories. 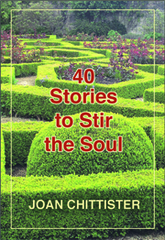 In 40 Stories to Stir the Soul, she looks at 40 soul-size stories and, with her usual insights, stretches idea after idea with playful abandon. The Jewish tradition teaches us that the shortest distance between a human being and God is through a story. Read this book and see if you agree. QUANTITY PRICES: 1-9 $6.00 ea.